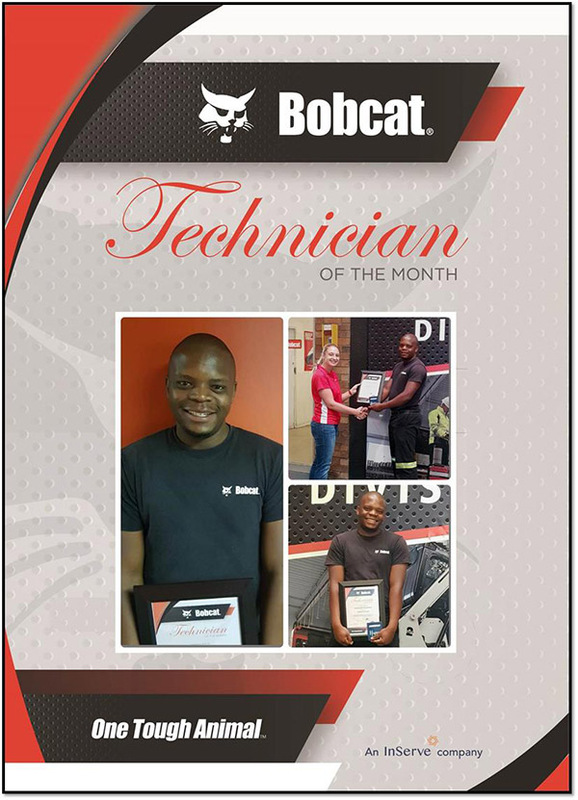 Congratulations Alex Musandiwa for being awarded “Technician of the month : January 2018”! Alex manages an average labour recovery of 68% across most months, is always willing to go the extra mile, gets on well with his colleagues and generally has a great attitude when performing his duties. 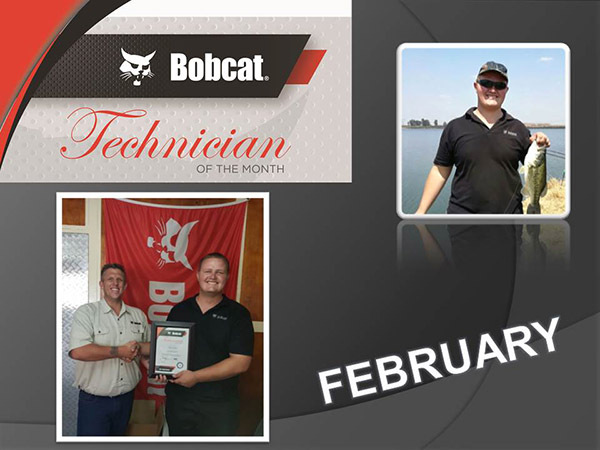 Congratulations Tinus Cronje for being awarded “Technician of the month : February 2018”! 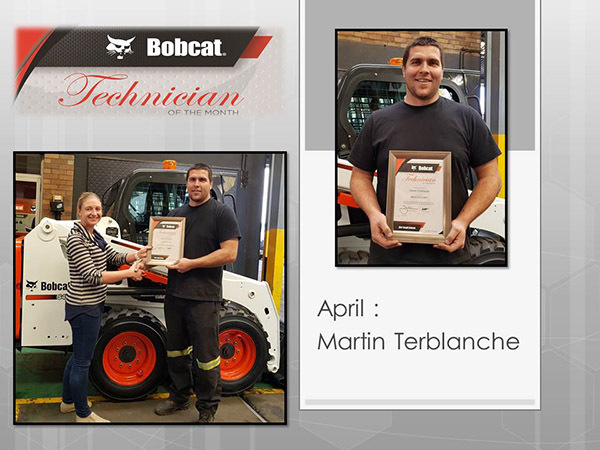 Tinus is a non-qualified Tech, but in the time of being with Bobcat he Stepped up in a major way, proving himself to us as well as to the clients he deals with. From day one he put himself out there to learn as much as he can about the machines we deal with, weather it is the Bobcat or Sany Range. He is always willing to go the extra mile to get the job done to satisfy the clients and make his stamp in the company. I never hear a sigh or unwillingness when sending him to a job or clients, normal hours, weekends or after hours even on Sunday Nights he attends B/Downs when needed. I get compliments of his knowledge, attitude and his the way he carries himself as well as the Bobcat and Sany names High. We have had compliments form clients like, T Services, with their Sany Machines, Troy from GT Plant, requests to ONLY deal with Tinus, Ingwenya New Clydes Dale Site and Minopex Phola at Ogies and Masters of Stone at Steelpoort also requests Tinus on their site as he is punctual, neat and solves the problem as fast as he can. He has really become a household name with our clients. He is not afraid to phone other techs or management for help to make sure the client is satisfied with the job. His paperwork is always correct neat and completed. Tinus manages an average labour recovery of 64% across most months and I’ve personally received some compliments from our sales team about his work ethic. 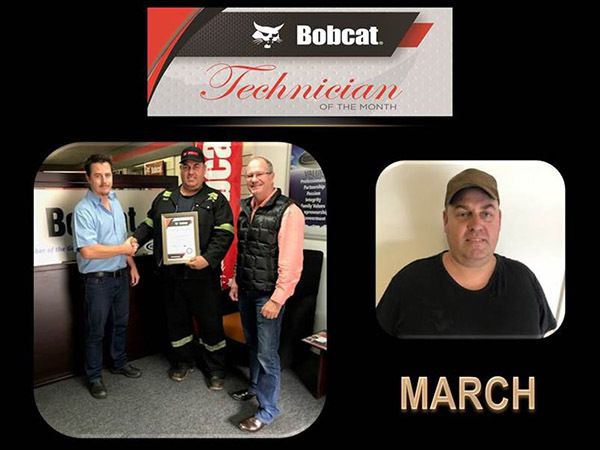 Congratulations David Hackland for being awarded “Technician of the month : March 2018”! He has been a tremendous help in the workshop and has even assisted me in parts when I needed him. He has never complained about assisting and has gone the extra mile many a time without a complaint. In the absence of Justin and Brian, whenever we received technical queries, David is always willing to chat to the client and assist the client in every way possible. David is quiet knowledgeable, I have often asked him questions about a job he is doing and he is always willing to share his knowledge with me and others. With myself and Brian travelling quite a bit lately David has taken on the responsibility of making sure that everything in the Durban workshop runs as smoothly as possible. He has given up some of his leave days, assisted the rest of his team members and has gone beyond the call of duty to ensure we deliver on the high level of service customers have come to expect from us. 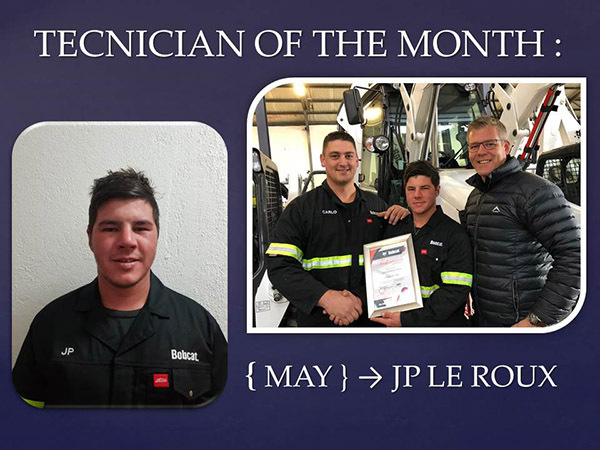 David’s labour recoveries for the last two months have been above 80% and I am really impressed with the way he has taken it upon himself to assist whenever needed to make sure our Durban customers are taken care of J.
Martin Terblanche for being awarded “Technician of the month : April 2018”! Based on feedback received Martin was awarded with this reward for one main reason : Pride in his work. Martin, this goes a long way as it shows in the quality you send out as well as the challenges you take on. “JP joined the Cape Town team in 2018 and has already shown in his short time here what it is to be a true Goscorian. JP is punctual, has a great attitude, always a willingness to help or assist and will go beyond of what is expected of him (without asking questions). JP is the kind of guy that just gets on with it and gets things done! 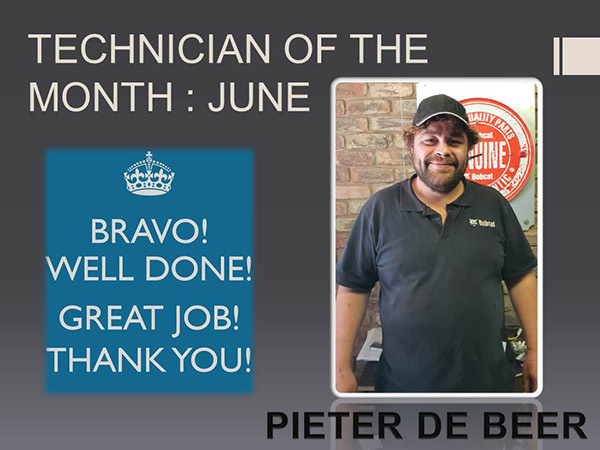 Congratulations Pieter de Beer for being awarded “Technician of the month : June 2018”! Pieter is always willing to assist all Technicians from other areas so that they can complete the jobs in a correct manner.